This book was just- Ugh. It was amazing. It completely blew me away. I really, really appreciated that it wasn’t a cancer story, not that cancer stories aren’t good! But I find if a book mentions illness, that illness is cancer (I’m talking about physical illnesses, not mental!) and it’s getting kind of boring and very repetitive. As I said, I really enjoy books like The Fault in Our Stars, Zac and Mia and so on, but it’s nice to have a change. After all, there are so many other illnesses out there unfortunately, and other people need books to relate to. I guess that’s why I loved this book so much. When Maddy’s mum says mentions how immune systems are complex and difficult to predict etc, I could have cheered (I did take a photo of the page for future reference – but that’s because I’m lazy and couldn’t be bothered to get up and fetch my tabs from the other side of the room…). Somebody gets it. So many people think that if you’re fit and healthy then your immune system is fine and if you have a deficiency then you take supplements to fix the problem but this book recognises it’s not always that simple. And I am so so grateful. 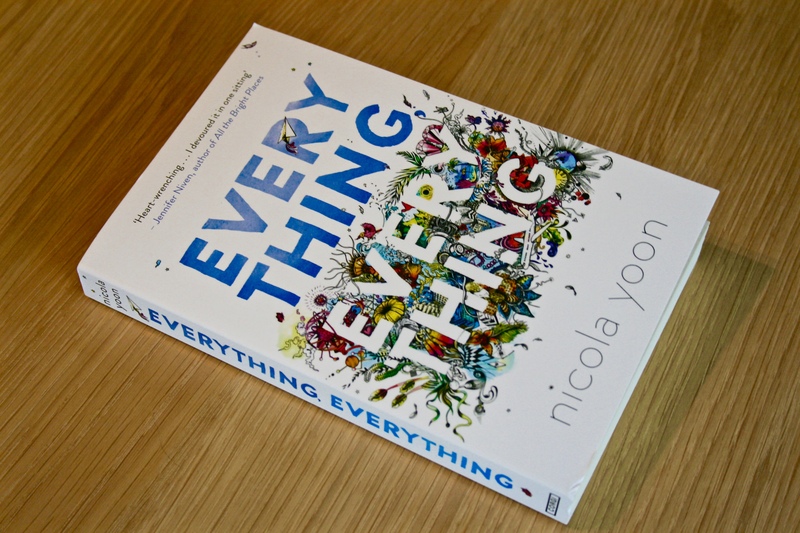 There are so many ways one’s immune system can turn against them – Nicola Yoon covered one way, and that’s good enough for me. That, and she raises awareness about rare diseases. I honestly couldn’t ask for a better message in a book. I also loved the characters in this book. They were all so different – Carla being Mexican, Maddy being half African-American and Japanese (if I remember correctly… Awkward moment when I’m wrong!) There are no stereotypical characters and I loved it. They all had their own quirks and something individual and interesting about their characters too, which was great as it added a depth to not just their characters but the story too. 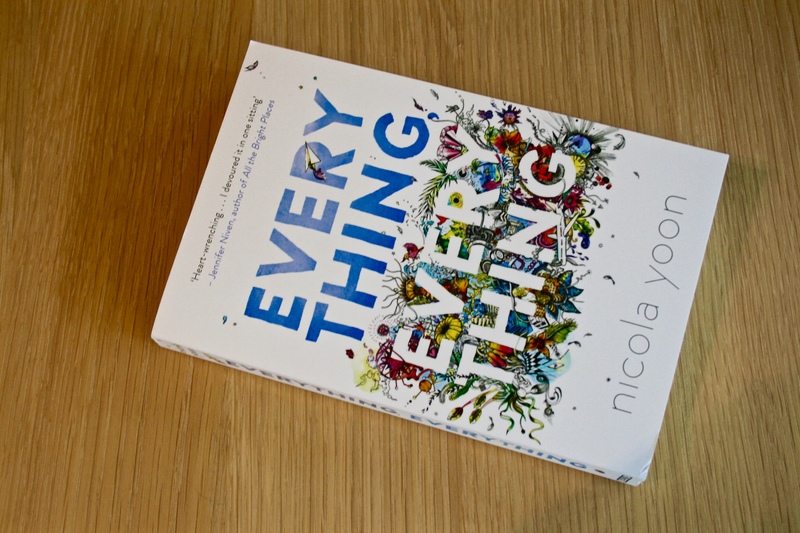 I think that what makes this book stand out is the way that it goes against pretty much every ‘norm’ for YA contemporary novels featuring an illness of some sort and a romance. Aesthetically this book is incredible. The cover is absolutely stunning – there’s no other word for it and inside there are graphs, notes, emails – loads of things that make it interactive and different. I personally love books that contain things like emails and notes and are presented in an alternative way. They draw me in more than regular books do, and they’re really effective ways of getting in content that would bore the reader if simply written out in a long paragraph. They also really kept the story flowing and it never really got to a slow part where I felt I had to keep reading – I wanted to keep reading. So I did. I ignored (probably – almost definitely) everyone (except maybe the dogs and shouts asking if I wanted a cup of tea – who says no to tea?) and read it in a day. It was that good. In fact, I think it was within like, eight or ten hours or something. The one problem I had with this book was its ending. You probably know what I’m about to say. The ending itself was great; super cute, adorable and just one of those feel-good endings. But it was rushed. A few more pages and there would be no criticisms of this book whatsoever. I’m not asking for many extra pages – maybe twenty? Just enough to round everything off and finish it up and left the reader feeling bliss. Because I felt (slightly) disappointed. I couldn’t bask in the glory of the ending, and it was a sad thing. However, what actually happened in the ending was so shocking and intriguing and as a reader I really felt as Maddy would have felt – angry when she was angry, hurt when she was hurt, happy when she was happy and so on. For the reader to feel what a character is feeling is something most books try to do, but only some do completely successfully, and this was one of those successful ones. Seriously though, if you haven’t read this, stop reading my review and go and read it. I still haven’t recovered from how amazing it was. Rating: (Need I say?) 5/5 stars (Nope, I’m not deducting anything for the end, because the rest more than made up for it). Can we please just take a minute to appreciate this cover? It’s so beautiful. Agreed. That cover is so flawless but i have not read the book yet.but i think I’ll have my eye on it now:) Great review by the way! !